IAN Lariba defied tough odds to become the first ever Filipino table tennis player to qualify for the Olympics. 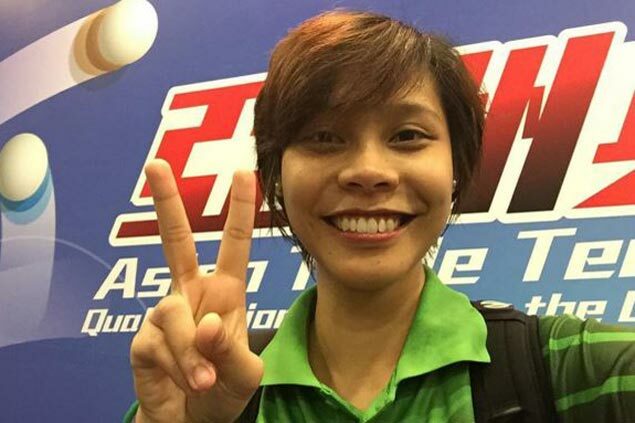 Lariba, a varsity player for La Salle in the UAAP, beat Indonesia’s Lilis Indriani, 11-6, 11-2, 11-8, 11-5, in the women’s singles on Saturday night in the 2016 ITTF-Asian Olympic Qualification Tournament in Hong Kong to secure the 11th and final Olympic seat in her event. Lariba thus became the fifth Filipino athlete to earn a ticket to the Rio de Janeiro Olympics, joining Eric Cray of athletics, Rogen Ladon and Charly Suarez of boxing, and Kirstie Elaine Alora of taekwondo, who also earned an Olympic berth on Saturday. Lariba had a tough road to Rio as she lost to Orawan Paranang of Thailand, 11-6, 11-2, 11-4, 13-11, in Stage One Southeast Asia bracket, relegating her to Draw D in Stage Two of the competition. The La Salle netter made waves in the classification phase as she beat Maha Faramarzi of Qatar, 11-5, 11-1, 11-7, 11-4, and Mahjobeh Omran of Iran, 11-6, 15-13, 11-8, 7-11, 10-12, 11-8, before losing to Nanthana Komwong of Thailand in the Draw D final for the Olympic berth. In the do-or-die match for the 11th and final Olympic slot, Lariba cruised past the Indonesian, sweeping the best-of-seven match to formally claim the ticket to Rio. Lariba was MVP in UAAP Season 78, leading La Salle to the league crown. She also saw action in the Southeast Asian Games in Singapore last year.